Strong writing and communication skills are hallmarks of a liberal arts education. Students are challenged to develop and further these skills throughout the entirety of their time at Saint Mary’s. Since every student must successfully submit a Writing Proficiency Portfolio to demonstrate her aptitude as a writer and communicator, one of the most valuable resources on campus is the Writing Center. Good writers—as well as writers who want to improve—share their writing and discuss it at length with others. Open six days a week and located in the Cushwa-Leighton library, the Writing Center offers guidance and support to writers in all stages of the writing process, from brainstorming, to composition, to revision. 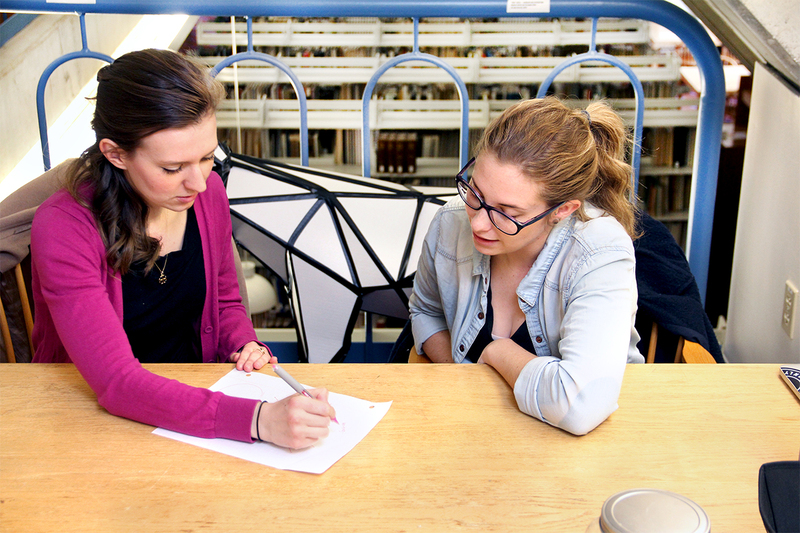 Whether you need help establishing a thesis, focusing your argument, creating cohesive paragraphs, strengthening your argument, or correcting your grammar, the Writing Center invites you to schedule an appointment and meet with a tutor. The Writing Center aims to create a welcoming, supportive environment and espouses a philosophy that emphasizes student development, rather than the grade earned on a paper. We care more about developing your life-long skills as a writer and communicator than we do about the specific paper you might be writing on any given week. Staffed by current juniors and seniors, the Writing Center welcomes students of all disciplines working on any type of writing, be it an analytical essay, a lab report, or a study-abroad application, to join us in energizing, collaborative conversations about their writing. Sunday - 7 p.m. – 10 p.m.
Monday - 1:30 p.m. – 4:30 p.m.; 6:30 p.m. – 10 p.m.
Tuesday - 1:30 p.m. – 4:30 p.m.; 7 p.m. – 10 p.m.
Wednesday - 1:30 p.m. – 4:30 p.m.; 6:30 p.m. – 9:30 p.m.
Thursday - 1:30 p.m. – 4:30 p.m.; 6:30 p.m. – 9:30 p.m.
Monday - Thursday: 11 a.m. – 1:30 p.m.; 4:30 p.m. – 6:30 p.m.
Friday: 11 a.m. – 3 p.m.